South Korea's President Moon Jae-in said Wednesday his planned third summit with North Korean leader Kim Jong-un next month would be another step towards the denuclearization of the Korean peninsula and an end to the 1950-53 Korean War. Establishing a joint economic community between North and South Korea and introducing the possibility of unrestricted cross-border travel will be "true liberation," South Korean President Moon Jae-in said. "We must overcome such a division for our survival and development. Even though a political unification may be a long way from here, establishing peace between the South and the North and freely visiting each other, and forming a joint economic community is true liberation to us," Moon Jae-in was quoted as saying by the Yonhap news agency. Moon said the community would include six Northeast Asia countries and the United States, while the president's office specified that the community would include North, South Korea, China, Japan, Mongolia, Russia, and the United States, according to the Yonhap news agency. "This community will lead to an energy bloc and economic bloc in Northeast Asia by expanding our economic area to the northern continent and becoming the foundation of co-existence and prosperity in Northeast Asia. And this will mark the start to a multilateral security system in Northeast Asia," Moon Jae-in was quoted as saying by the Yonhap news agency. Moon added that he hoped for the full denuclearization of North Korea. 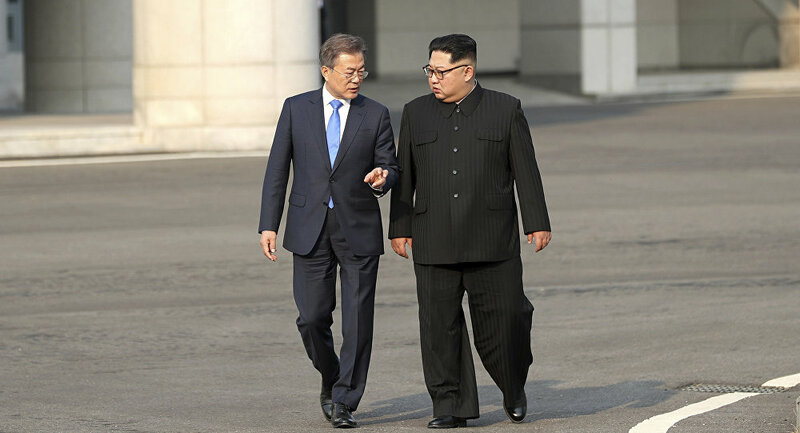 When the peace has been established, the countries may set up at least two special economic zones next to Gyeonggi and Gangwon provinces, Moon said, according to the Yonhap. South Korea's President reportedly added that the railways of South and North Korea could be linked up by the end of the year, stressing that a Northeast Asia linked railroad may help facilitate further regional integration. Moon's special adviser on foreign affairs said Tuesday that the next summit between South Korean President Moon Jae-in and North Korean leader Kim Jong-un may take place on September 12-13. The official reportedly said the meeting was unlikely to take place earlier than September 9. On that date Pyongyang is celebrating the Day of the Foundation of the Republic. At the same time, the presidential adviser said that the possibility of North and South Korea announcing the end of war at the General Assembly of the United Nations at the end of September "decreased," but it still existed. Moon Jae-in and Kim Jong-un have met twice since the beginning of the year, in April and then in May.